If you have found your way to this page either you have an Albin Ballad and are concerned about its truss, or you are looking to buy one and have heard some reports of the Ballads Achilles heel. Where is the truss and what does it do? The truss sits directly beneath the mast step and sole. It is a mild steel member with about 80% of its depth encased in thickened, exceedingly hard, polyester resin at the front edge of the keel. It supports the mast step and drives the rig loads (around 3 tonnes of them) down to the keel. In later Ballads, presumably Albin Marin noted the problem and attempted to fix it by sealing up the top of the truss. What’s the problem with that then? Fundamentally? Nothing. Rust is a process that happens when air and water meets metal – if the area never, ever gets wet, damp or comes into contact with moist air, it will never rust. Boats, however, do go on the water, and they do, believe it or not, get wet. So the truss will rust, if you look after your Ballad, it may never be a problem, if your boat has ever had standing water in her (as mine had), it will be almost certainly be a problem at some stage. Gads, how does failure occur? As the truss rusts, it expands. If you have an earlier Ballad with the top of the truss exposed, the area above the resin will rust significantly faster than the rest of it. The area below the pour will rust and expand and put huge energies into splitting the front of your keel open (where the two halves of our beautiful Ballads were joined). 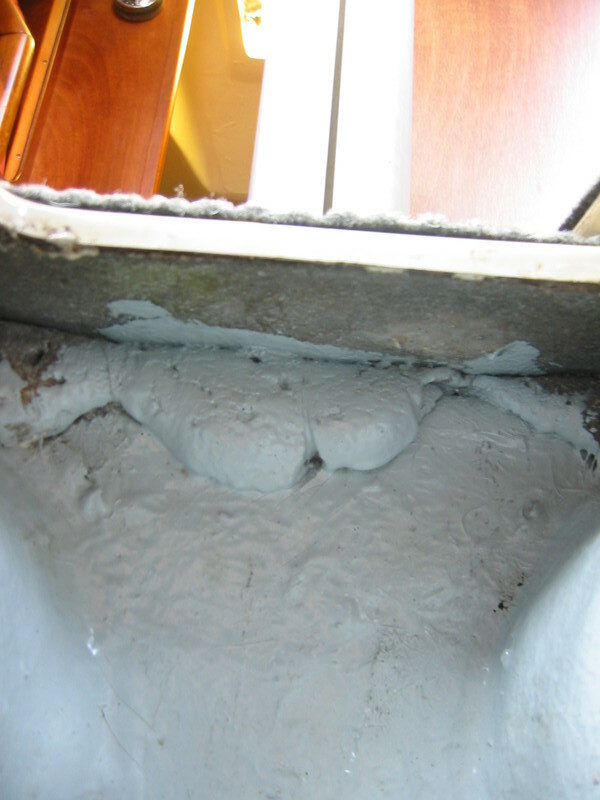 The first you might notice of the problem is a dark patch at the front of your keel, which will eventually split and you will notice water start to seep into the bilge. Note the dark patch beneath the crack below – at that point the keel was 90% split. Ken, long time owner of Shebeen, kindly gave me this account of his own truss failure and his repair process. I had the frightening experience, my mast step support completely collapsed during sailing in quite bad weather and rough seas. The front of the keel could not handle the pressure and as a result of that water came in to the boat trough tiny cracks at the front of the keel. I had the boat cut open (a very big opening, you could actually go into the boat through the opening) and tock the mast step support out in several tiny bits. I had a new one made I stainless steel and then rebuild the entire area including the front of the keel. I had professionals to do the job. This was 13 years ago, and I did speak to several Ballad ovners at the time, and even the Danish Ballad club, and try to tell the story, but no one would listen to me and just told me that this was only my Ballad that was build that way, and all others Ballad was fine. Today we had seen quite a few boats with these problems in Denmark, and some of them with high hull numbers, but most not as dramatic. And I now for a fact that all Ballads build by Albin in Sweden is build that way. Some is trying to rebuild without removing the entire support, I do not know how those boats are sailing. For my part, it was like having a completely different boat, the stiffness were back, and the boat is still sailing and is sailing good. Feel free to write if you have questions. I used to own an Albin Ballad. At the base of the mast step there is a steel member encased in GRP. It is behind and underneath all the woodwork and very difficult to see. On my boat the steel rusted and spalled the GRP. This in turn lead to the mast dropping by about 1″. At the same time the webs the bulkheads are bolted to started to pull away from the hull. Despite this being a latent defect, Navigators wouldn’t cough up. Rather than throw good money after bad, I sold her for spares or repair. Moral of the story, if your rig has started to slacken off, don’t wind it on without a bit of investigation first! And finally, these two editions of the UK Albin Ballads owners association. UK Ballad Association Winter 2011 newsletter – On page 10, Graham Smallridge of Duchess reports a frightening experience when the front of his keel split open at sea. UK Ballad Association Summer 2013 newsletter – Alan Harris-Guerrero (a fine sail maker of Sail Shape on the South Coast) of Balladier suggested a great fix that I used as the basis for my own fix. He also put up with being bombarded with myriad email questions relating to his own experiences from me and was a great comfort when fixing Triola. How do I know if my truss is failing? The truss is nearly completely hidden from view on older Ballads, and on newer Ballads its completely sealed off as Albin Marin tried to mitigate any problems with the truss. The below is a picture taken on Peters Ballad, Bennath, which is a 1976 boat and has the bulkhead aft of the truss sealed up. In my case this gave some alarming results, with bits of truss falling away as I probed with a screwdriver. 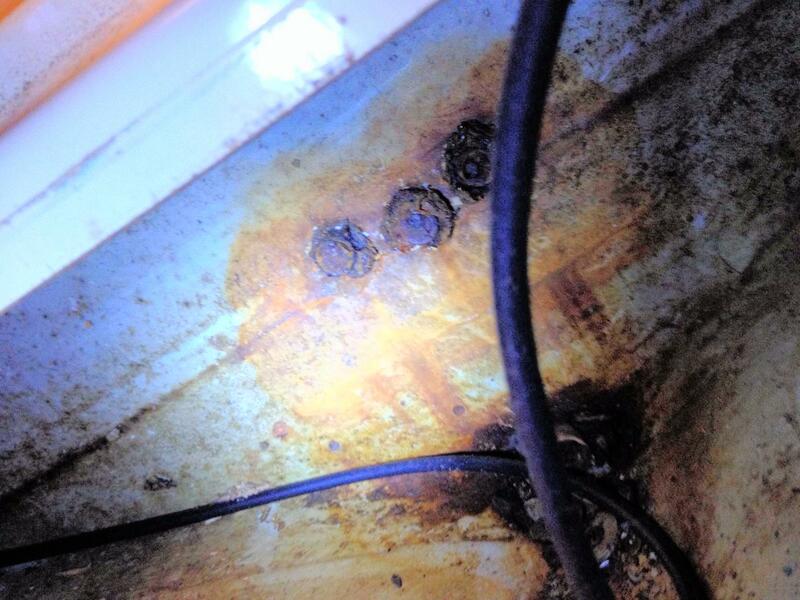 Another hint that you have a problem, is take a look in your forward bilge at the bolts through the bulkhead. If these are rusted to the point of disintegration, it doesn’t take too much imagination to suspect what is going on the other side of the bulkhead. The final hint you have a problem, will be that dark patch at the front of the keel that was discussed earlier. The fix isn’t actually that complicated, it is time consuming, and a little alarming in places (especially if your keel has split). See our fix here.